Beating them tomorrow night would be an even bigger step towards finishing ahead of the Highlanders in the two-horse race to be crowned champions. 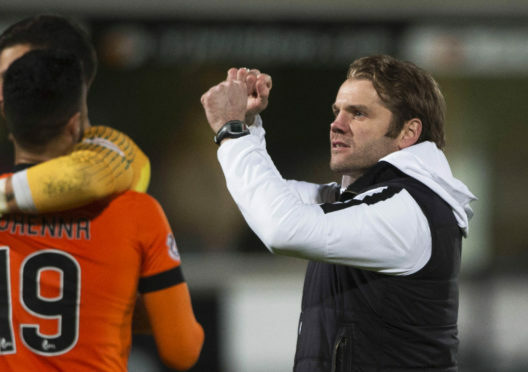 United manager Robbie Neilson watched County steady their ship with a narrow derby victory against Inverness Caley Thistle on Tuesday night. And his own team’s mission in Dingwall is to make sure that their recently-earned breathing space at the top of the table does not last long – and that they close within one result of leap-frogging their rivals. “For us, the game on Friday was always going to be must-win,” said Neilson. “It doesn’t matter whether we’re five points behind or two points behind. We have to go there and win it. “We’re sitting here in a much better position than we were going into the last game with them which we won 1-0. “We were 11 points adrift back then, but since then we’ve managed to claw it back. United have won the last two head-to-heads between the sides, which should give them confidence on this occasion. “We already know that we can get at County,” said Neilson. “We’ve beaten them twice this season. “We know that if we’re on our day and playing well, then we’re more than a match for them. “From watching County on Tuesday night, I don’t think they’ll be as open and expansive as they were against Inverness. “I think they’ll be a bit more defensive. They will probably be happy with a draw because they know they don’t need to win the game. Neilson added: “Dingwall is a good place to go. I’ve always enjoyed it up there. “It’s a good pitch – quite a tight stadium – and it makes for a good intensity. “We’ll be able to bring up a big support like the last time. “It obviously helps the fact we’ve beaten them twice this season. “Those were both tight games. We had to battle for the points on each occasion. “When you win any top-of-the-table match, it’s always a good feeling. “But we know it will be tough again as County are coming off the back of a good derby win. Osman Sow is unlikely to make the United squad but Neilson is confident that the former Hearts striker will yet have a big part to play in the Tangerines’ promotion push. “Sow is still struggling a wee bit,” he reported. “I pushed him in the recent Partick game. It was too early trying to get him some game-time so then had to pull him off after 20 minutes. Peter Pawlett should benefit from the one-match-a-week schedule United now face. Neilson said: “Peter is fine. He’s had a wee groin issue but now only playing one game a week will make a big difference. Mark Connolly is back in training and in contention.